a lump in your neck? ATA Physician Members and our ATA Alliance Partners are available to meet with thyroid patients and their families during the forum. This program is free and open to the public, please register/confirm your participation here. Please come if you have questions, symptoms, or concerns about a thyroid problem. We invite anyone who has had an overactive or underactive thyroid, thyroiditis, a thyroid nodule, thyroid cancer, or a family history of thyroid problems or related d isorders, including rheumatoid arthritis, juvenile diabetes, or pernicious anemia. Free educational materials will be available for all. Reservations requested. Walk-ins welcome. 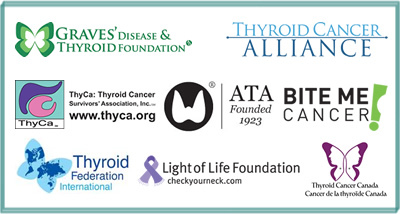 E-mail thyroid@thyroid.org with any questions or requests for additional information.